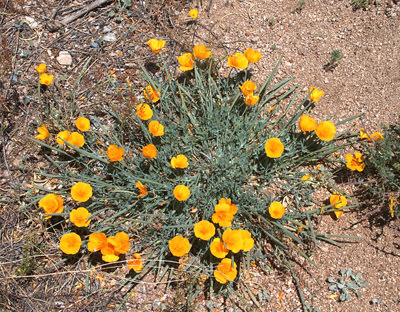 Known by several different common names in different geographic areas, this species of poppy is the official state flower of California, hence one of its common names is ``California Poppy''. It is also known as a desert California poppy and a Mexican Gold Poppy. The petals close at night and in cold, windy weather. 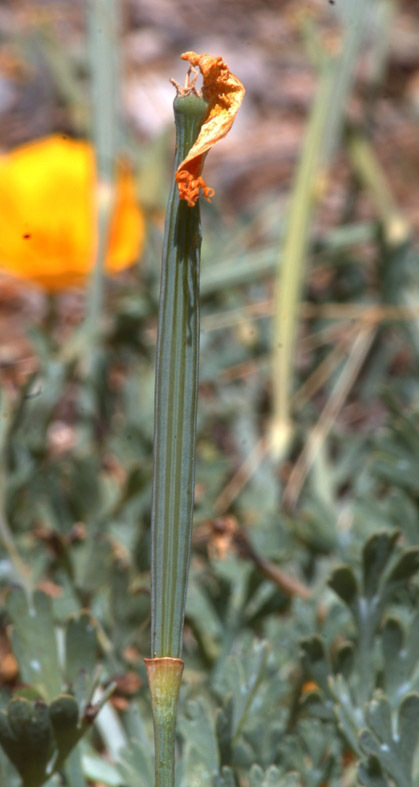 Unlike the poppies used to produce opium, the alkaloids in this poppy are a different class, and the effects are far milder. Photographed at Aguirre Springs campground, May 8, 2005. 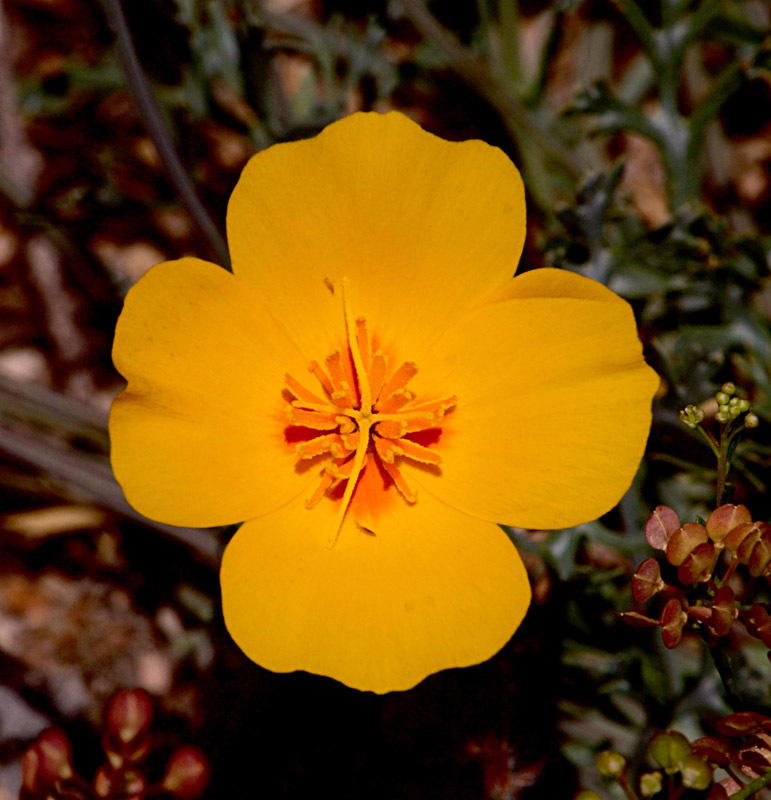 The flower of Eschscholzia californica ssp. mexicana is generally a rich yellow-gold color as seen here. Photographed at Aguirre Springs campground, May 8, 2005. 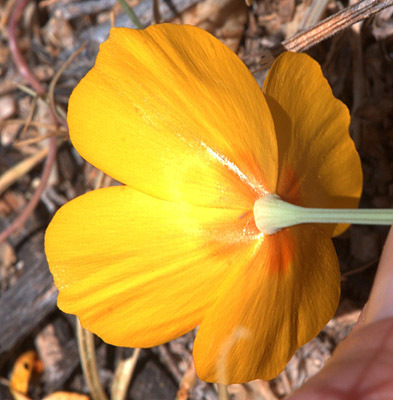 The back of the flower of Eschscholzia californica ssp. mexicana. Photographed at Aguirre Springs campground, May 8, 2005. The seed pod of Eschscholzia californica ssp. mexicana. You can see the remnants of the spent flower at the top. The colors of lines on the seed pod can become more pronounced as it ages. Photographed at Aguirre Springs campground, May 8, 2005. 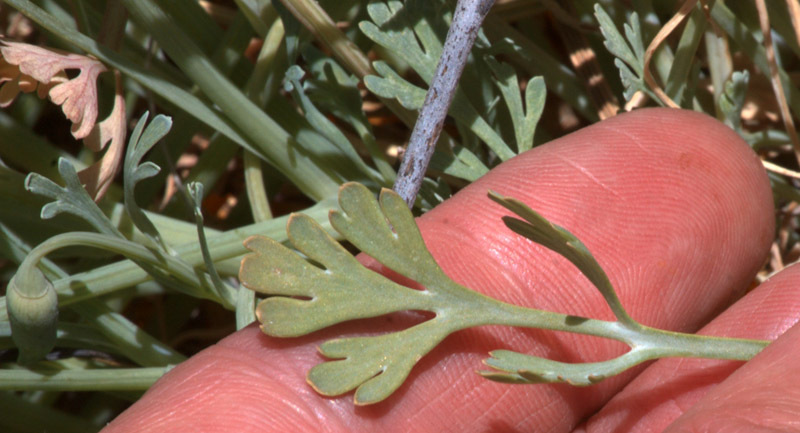 The leaves of Eschscholzia californica ssp. 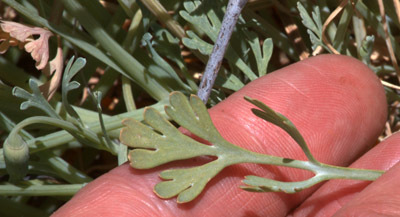 mexicana, which are a grey-green in color, lacy in appearance with deeply dissected lobes. Photographed at Aguirre Springs campground, May 8, 2005. 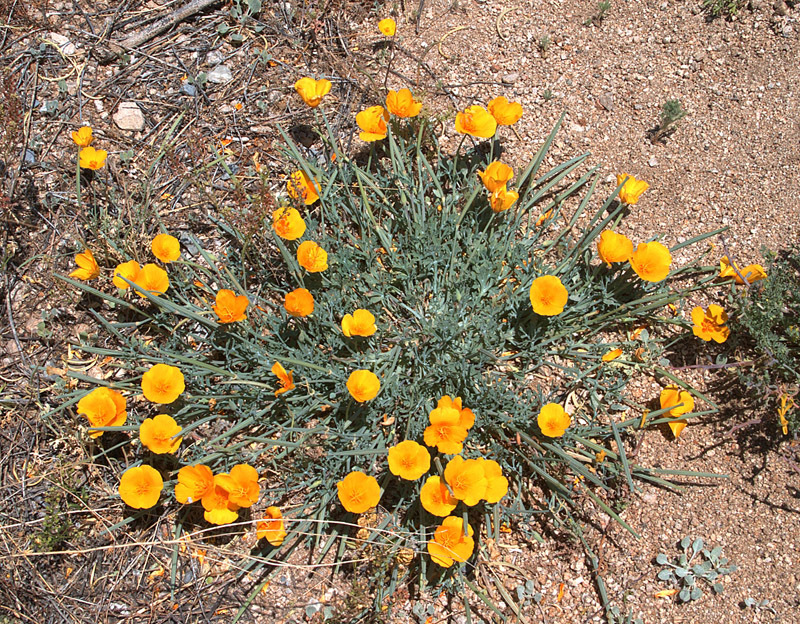 The flowers of Eschscholzia californica ssp. mexicana can vary in color, with white flowers also being seen. 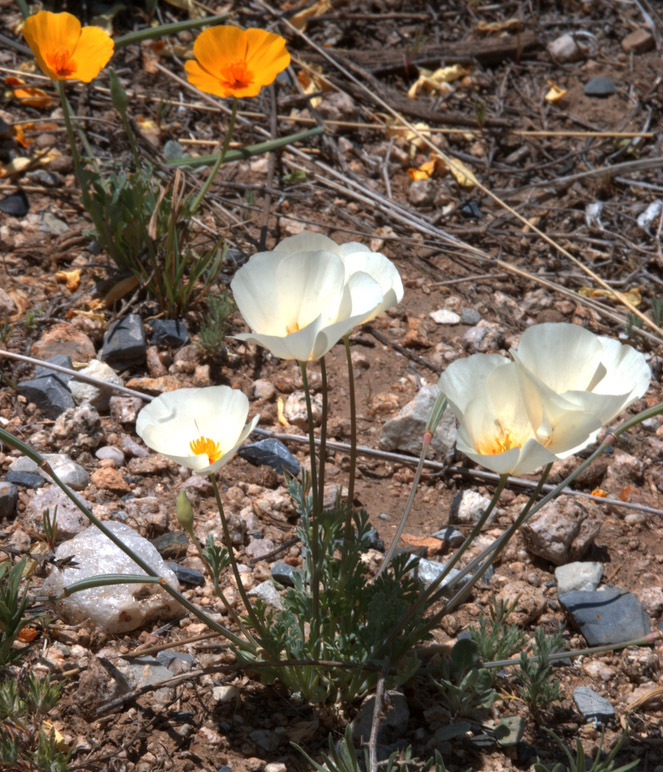 Photographed at Aguirre Springs campground, May 8, 2005.